As a privateer, Captain Henry Morgan battled through jungles and in major sea battles for the spoils of war. This coat is a great homage to a pirate known as a real man's man. We have used a beautiful blood red cotton velvet with a matching red cotton lining. Beautiful gold rope trim has been hand applied and capped off with brass buttons. 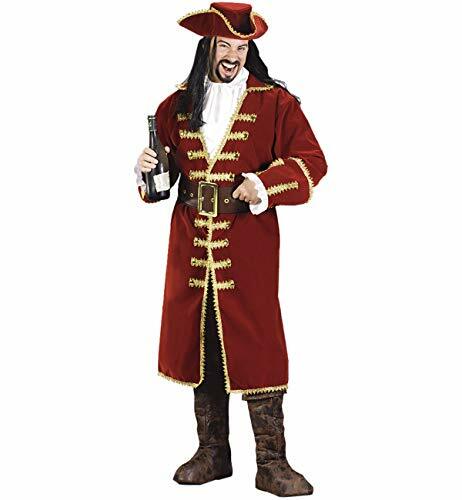 Our Captain Morgan costume includes coat with ruffled cuffs, shirt front, pirate hat and belt. 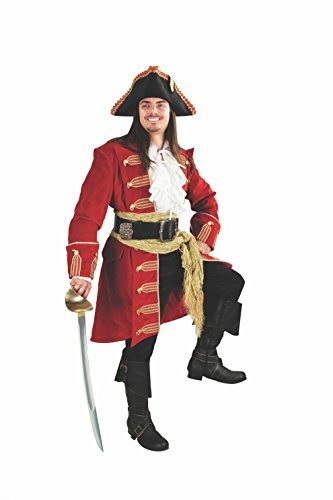 The Captain Morgan costume comes in adult size Standard. The wig, boot tops and rum bottle are not included with this Captain Morgan costume adult pirate. Fun World Men's Captain Black Heart, red, STD. Up to 6' / 200 lbs. Part No: 5407-N/A-STD. Up to 6' / 200 lbs.